On January 1, 2020, U.S. banks will be required to change how they account for loan losses. Under a new FASB standard – Current Expected Credit Loss (CECL) – banks will be required to maintain an allowance that equals, for each loan, total losses expected over the life of the loan. Currently, a bank is required to establish an allowance only when it concludes a loss is probable and estimable. CECL was adopted in large part because it was meant to be countercyclical – the goal being for banks to build their allowances in boom years when lending standards weaken and then draw them down in a recession when lending standard tighten. In a recent working paper, however, we demonstrated that CECL will, in fact, be procyclical in practice: Allowances will go up in bad times when banks mark down their forecast for the economy – which heavily influence the outlook for loan losses – and down in good times when the forecast improves. In particular, we show that, if CECL had been in place during the financial crisis, allowances would have peaked in the fourth quarter of 2008. In a recent UBS Analyst Conference Call, a FASB Board member stated that our working paper was wrong and that CECL would, as intended, be countercyclical. As evidence, he cited three other studies. In this blogpost we analyze each of the three studies. Two of the three studies show that CECL is countercyclical only when the models incorporate the assumption of “perfect foresight” (that is, when the future course of the economy can be perfectly predicted) and is procyclical when the perfect foresight assumption is relaxed – fully consistent with the findings of our working paper. Moreover, the papers show that CECL would have been procyclical even after taking into consideration the deterioration in loan quality that occurred in the years prior to the crisis. The third study simply provides no evidence on whether CECL is pro- or countercyclical. The three studies cited during the call were, Chae, Sarama, Vojtech, and Wang (2018), Breeden (2018) and deRitis (2018). We discuss each of the results of the three studies in the remainder of this post. 1. Chae, Sarama, Vojtech, and Wang (2018). This paper calculates CECL-based reserves for 30-year fixed-rate first-lien mortgages that were originated in California during the period between 2002 and 2015. The paper uses a loan-level data to estimate a stylized mortgage default model. Importantly, the model controls for lending standards used by banks at the time the loan was originated. The chart below shows CECL-based allowances taken from Covas and Nelson (2018). 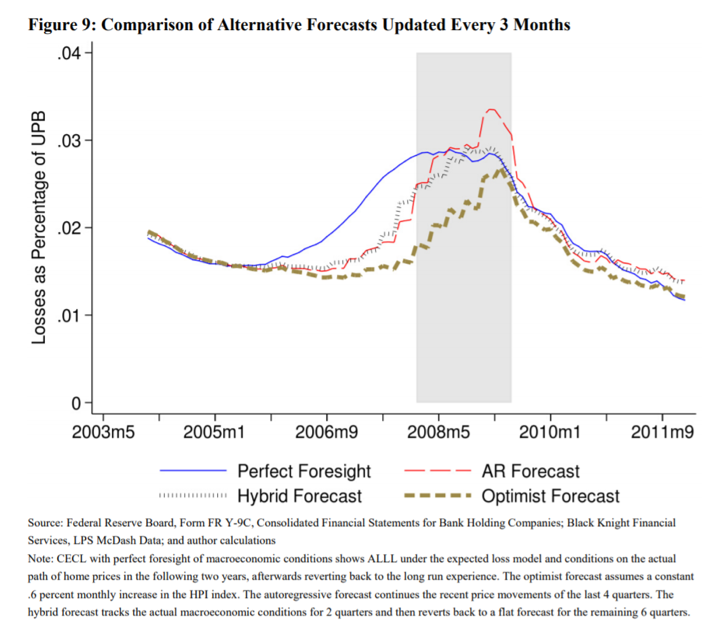 Our evidence is very similar to Chae et al (2018), in that in real-time CECL-based allowances rise abruptly at the onset of the crisis as forecasts are being updated and exhibits some overshooting relative to the perfect foresight case. As a result, the paper by Chae et al (2018) cannot be used as evidence to counter the results provided in BPI’s research as they are very similar, despite the use of very different models. 2. Breeden (2018). This paper also computes CECL-based reserves for 30-year conforming fixed rate mortgages using loan-level data between 2001 through 2017. An interesting feature of this analysis is that it used consensus forecasts available at the time and did not generate macroeconomic scenarios like Chae et al (2018) and Covas and Nelson (2018). 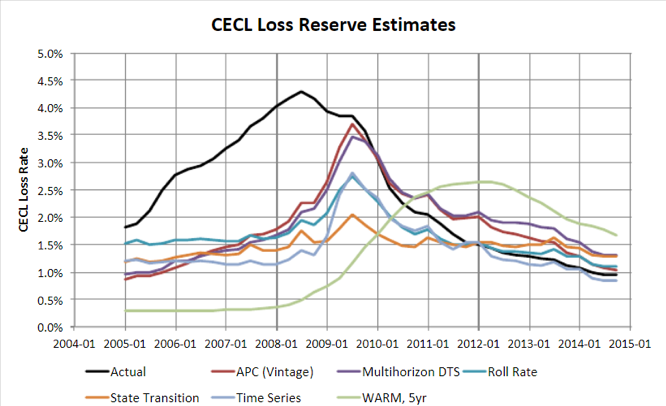 The chart below (copied from the paper) depicts projections of CECL-based reserves between 2005 and 2014 using a variety of models. 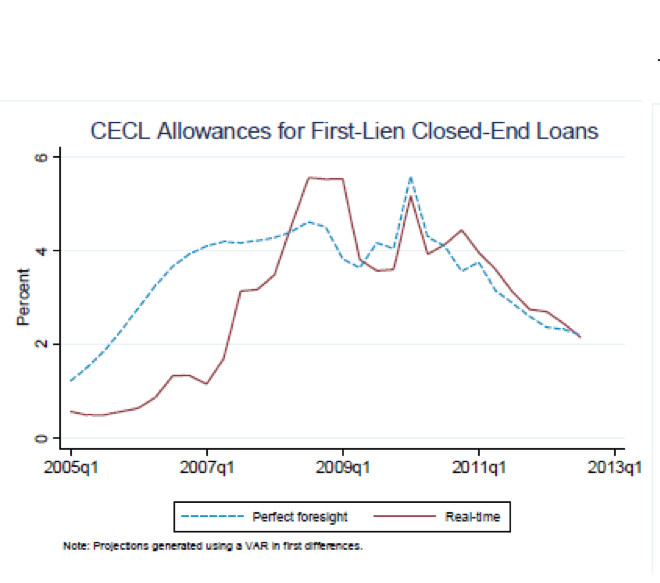 The black line shows CECL-based allowances under perfect foresight, which once again shows loan allowances rising well before the start of financial crisis. The remaining lines show CECL-based allowances under various models using consensus forecasts available at the time. The results show that without perfect foresight CECL-based reserves would have risen abruptly at the onset of the recession and would have accentuated the contraction in credit availability. The degree of procyclicality varies across models used to project expected loan losses, but almost all models project sizable increases in CECL-based reserves during 2008 and 2009. 3. DeRitis (2018). This paper also uses single-family loan level data made available by the GSEs to compute CECL-based reserves. Similar to the BPI study, the paper generates macroeconomic scenarios to construct projections of CECL reserves. However, the paper only estimates CECL-based reserves for the first quarter of 2005 under several macroeconomic scenarios. Thus, it is not possible to discern the cyclical properties of CECL as the paper does not estimate CECL reserves through the cycle. To do so, the paper would have needed to estimate CECL-based reserves for all time periods before and during the crisis. Importantly, the analysis would also have to address how the macroeconomic scenarios are being updated over time. In BPI’s own work, the procyclicality of CECL is driven by the large forecast errors that arise around business cycle turning points. Although not cited on the aforementioned call, a paper by Abad and Suarez (2017) also finds CECL to be procyclical for a portfolio of European corporate loans. Lastly, Ryan (2018) also notes that CECL will be procyclical for banks in bad times. Another limitation of all these papers is the focus on a particular portfolio during the past financial crisis (in most cases, conforming 30-year fixed rate mortgage loans). BPI’s analysis studied the behavior of CECL-based reserves across all loan portfolios, not just mortgage loans. As a result, we were able to derive the impact of “real-time” CECL-based allowances on regulatory capital ratios and provide a more comprehensive assessment of the procyclicality of CECL.